By Gregory Puthoff, D.O., Rocky Saenz, D.O. A 50-year-old woman presented as an outpatient for follow-up imaging after completing chemotherapy and radiation for rectal adenocarcinoma. 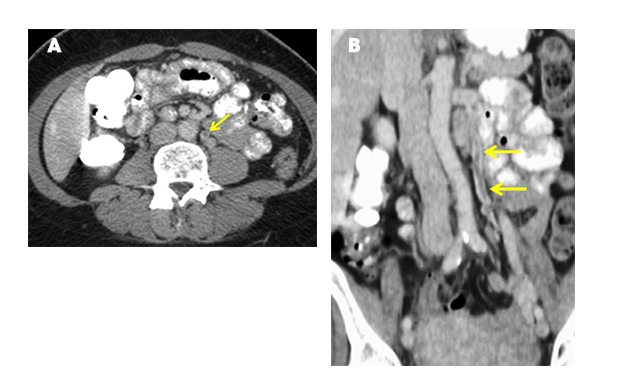 A contrast-enhanced computed tomography (CT) examination of the abdomen and pelvis was performed, which demonstrated a new long segment filling defect within the left ovarian vein (arrows, A and B), consistent with ovarian vein thrombosis. No surrounding inflammatory stranding was noted. Isolated ovarian vein thrombosis is an important, although rare, etiology of abdominal and pelvic pain. Risk factors for ovarian vein thrombosis include pregnancy, pelvic inflammatory disease, recent gynecologic surgery, malignancy, chemotherapy, and trauma.1 Often, it presents as thrombophlebitis in pregnant or postpartum women experiencing abdominal pain and fever of unknown origin. Harris K, Mehta S, Iskhakov E, et al. Ovarian vein thrombosis in the nonpregnant woman: an overlooked diagnosis. Ther Adv Hematol 2012;3(5):325-328. Karaosmanoglu D, Karcaaltincaba M, Karcaaltincaba D, et al. MDCT of the ovarian vein: normal anatomy and pathology. Am J Roentgenol 2009;192:295-299. Puthoff G, Saenz R. At the Viewbox: Ovarian Vein Thrombosis . J Am Osteopath Coll Radiol. 2016;5(2):31. Gregory Puthoff, D.O., Rocky Saenz, D.O. Gregory Puthoff, D.O. and Rocky Saenz, D.O. are with the Department of Diagnostic Radiology, Botsford Hospital, Farmington Hills, MI.